WATERLOO – Wilfrid Laurier University’s Changing Arctic Network (CANet) research team has been awarded $3.2 million in funding from the Canada Foundation for Innovation (CFI) to continue to build Laurier’s global leadership in cold regions environmental research. Partners on the project include the Government of the Northwest Territories, Université de Montréal, the University of Guelph and the Laurier Institute of Water Science and the Cold Regions Research Centre. 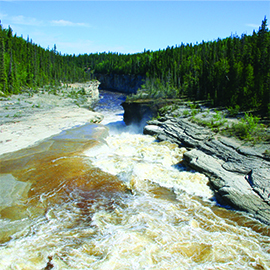 Laurier’s researchers have worked for decades in the Northwest Territories (NWT), studying the environment and aligning their research projects to GNWT and community priorities. Laurier research has influenced the development of evidence-based environmental policy that has translated into practical applications to support ecological integrity and human health, such as shaping government policy on seismic exploration and the impacts of permafrost thaw on water resources. More than $15 million in operating and infrastructure funding has been secured for NWT research. Laurier has trained more than 50 graduate and undergraduate students, with 20 more who will be trained in the NWT in 2015. Website for outside info: nwtwlu.com.